and I thought I'd share something new I'm adding to the mix. 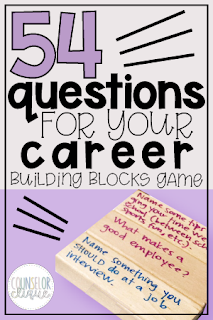 I bought a classic Jenga set and wrote career-type questions on them about dream careers, interview etiquette, and interview type questions. Thus, Career Building Blocks Game was born. I think it'll be a great game for all grade levels of students across the board. 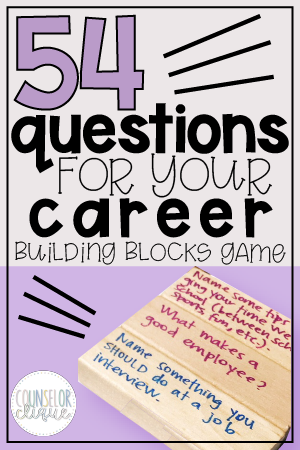 I first came up with 54 questions for the 54 blocks then wrote them on the blocks with Sharpie Pens. Click here to visit my Teachers Pay Teachers page for the questions I wrote on my blocks, an ASCA aligned lesson plan, and a pre/post assessment for your perception data needs! Also check out my Social Skills Building Blocks Game while you're at it! Are you doing activities for students in classrooms? If so, what are they? Good! I think you will find that students will LOVE it! It was the favorite station that they rotated through when we did career stations. All grades! Definitely! Fun to play in a group with them as well! What a cute idea! Do they answer the question before they can put the block on or do they answer one when they all fall down? They pull the block, answer the question, and stack it back on top! Game is over when the tower tumbles! I'm really interested in what your questions are. I don't find an attached posting. If you could send them that would be great! Love this! It is so hard to get high school students engaged and to take classroom guidance lessons seriously. I will absolutely be using this in the fall, THANKS! Of course! It's constantly the favorite activity of my stations I'll do related to careers! Nice way to engage the students and keep them thinking for the answers! I will share this with members of KudosWall. This is a wonderful idea! Thank you! I've just ordered my own Jenga and starting to translate the questions to Swedish. Can't wait until I can play with it with my students! What other activities did you use as part of your career stations? Do you have links to those as well? Great question! I will get some of those resources together. That's a great idea for another post! Stay tuned! Why Career Coaching? Welcome to Careers Come – career coaching at its finest. We are privileged to offer you all the help and coaching you need in your quest to find the ideal career path and complete success.